Equal Pay Day is April 12 this year. It symbolically marks how long into the new year full-time working women need to work until their earnings can catch up to what full-time working men earned the year before. 1. Women generally earn 79 cents for every dollar men earn. Or 78 cents. Or 77 cents. It depends on the year, but the figure hasn’t really moved meaningfully since 2000. It does help capture, however, the types of barriers women face at work, said Katherine Gallagher Robbins, director of research at the National Women’s Law Center. Those barriers include being paid less for the same work, being overrepresented in low-wage positions, and facing wage penalties for being a mother, especially if they take time out of the workforce. Race and ethnicity can be barriers too. African-American women in 2014 were paid 60 cents for every dollar white men earned, while Hispanic women made only 55 cents, according to NWLC. Asian women, however, fared better, earning 84 cents. 2. The pay gap really adds up. In 2014, the median income for men who worked full-time was $50,383. For women, it was $39,621. That $10,762 disparity works out to $897 a month. That’s money that could be very helpful in paying for rent or food or clothes or repairs or other emergencies. 3. The gap is often much smaller if you compare like to like. 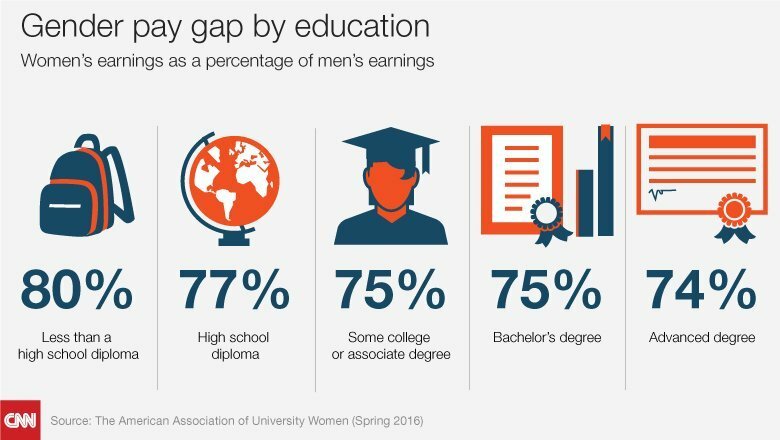 When you look at the earnings of men and women with the same job title, at similar companies with similar levels of education and experience, women still get paid less, but the pay gap is much narrower. A recent study by Glassdoor, for instance, found women earned 95 cents for every dollar their male colleagues doing the same job were paid. It’s hard to say definitively what accounts for that nickel gap. Some of it may be due to outright workplace bias. Some may be due to women negotiating smaller raises than men. And some may reflect job choice. For instance, a woman with young children may have a job with a title that reflects her seniority but opts to work at a company that pays somewhat less in exchange for more flexibility. 4. Still, no industry yet offers equal pay for equal work. The same Glassdoor study also found that on average women earned between 2 cents and 7 cents less for every dollar their direct male counterparts made in 25 major industries. 5. Some high-skilled jobs have the worst pay gaps. You might think becoming a doctor in a specialty — with all the training and experience that requires — would inoculate a woman against the pay gap. Apparently not. Among the most egregious examples of unequal pay for equal work in medicine: Male ophthalmologists reported earning 36% — or about $95,000 a year — more than their female counterparts, according to a recent study. The story is similar among cardiologists: Men made 29% — or about $97,000 a year — more than women. Or take a high-octane career in technology. Female computer programmers earn just 72 cents for every dollar their male counterparts get paid. 6. Occasionally, though, women get paid more than men. There are some occupations — such as social worker — in which women actually get paid more on average than their male colleagues. But this reverse pay gap is fairly narrow. For instance, women social workers earn about $1.08 for every dollar a man earns. Compare that to, say, women pharmacists — who earn 78 cents on the male dollar.